Changes to the Marine Corps Marathon course are exciting local runners and likely going to mean faster times this October. Runners will not have to endure a big hill around the Georgetown Reservoir between miles seven and eight. Instead, from miles six through nine, runners will run up Rock Creek Parkway to the bottom of Calvert Street and back, a stretch used in the Navy and Nike Women’s half marathons, as the MCM course returns to a pre-2007 design. Previously, runners turned left onto Canal Road off of the Key Bridge to Georgetown on the way to the big climb up Reservoir Road into the Palisades, past the Georgetown Reservoir and down McArthur Boulevard and Foxhall Road. On the new course, runners will hit Georgetown’s M Street earlier in the race, in mile five, before they head down to Rock Creek and Potomac Parkway and then around Hains Point. Another change, though minor, occurs late in the race as runners loop around the National Mall. The marathon will now cover 3rd Street to Constitution Avenue. It previously routed through a parking lot on Pennsylvania Avenue alongside the Capitol reflecting pool. Public Relations Coordinator Tami Faram said MCM organizers “made an operational decision to make the course both safer and more scenic.” Rock Creek and Potomac Parkway had been a part of the race course from 2001 to 2006. In 2007, MCM had 20,622 finishers, about three thousand less than in 2012. The growth in participants, Faram said, made the hairpin turn at Canal Road both more difficult and congested. Banker, who has run MCM 28 times, was nice enough to dig through this binder recently when we asked him what he thought about flatter course. As Banker recalls, the course when Scuffins set his record, had runners starting on Route 110 in Virginia and heading south in Crystal City up 15th Street. 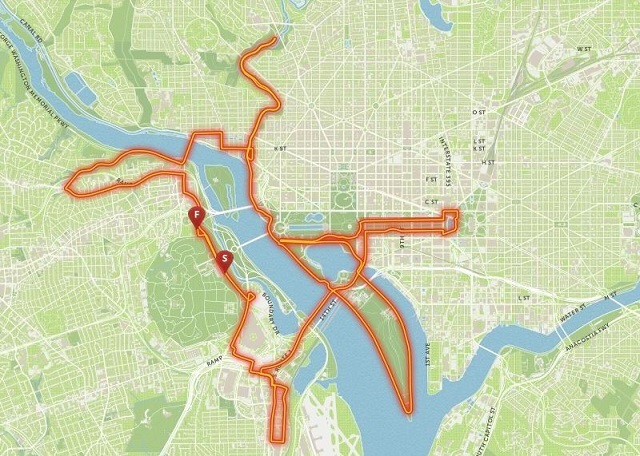 You would end up looping back across the starting line at about 7 miles and take Route 66 over the Key Bridge to Georgetown’s M Street, he explained. Back then, you hit Mile 20 out on Hains Point; the one real hill was behind the U.S. Capitol on C Street. Does MCM returning to its pre-2007 design – sending runners out-and-back on Rock Creek and Potomac Parkway – make it a significantly faster course? Two local runners aiming to set new personal bests in the marathon agree. Michael Rohlf, who ran MCM from 2010 (his first marathon) through 2012, said he paid the toll of those early hills later in the race. The hills, he added, also made it tough to settle into a good early rhythm. In his first attempt to break three hours last fall, Rohlf tired late in the race, he said, and ran 3:12. This fall, in an attempt to achieve his goal, he signed up for the Philadelphia Marathon, which he figured would give him a better shot. “But now that the MCM course has been changed, and in my opinion improved, I really look forward to running it again – maybe next year,” he said. Colleen Lerro is entered in her third MCM this year and hopes the course change will give her a better shot at qualifying for the Boston Marathon. She ran her first MCM in 2006, before the course change. If Lerro does not achieve her goal this year, she will be “much pickier next year” and choose a flatter course. Regardless of the layout, though, MCM is Lerro’s favorite marathon, and “the course I would love to get my BQ on,” she said.